Disability and instability of the unique atlantoaxial joint result in controversies regarding the management of acute trauma and also the screening evaluation of particular at-risk individuals. The purposes of this article are to define atlantoaxial instability (AAI); describe the relatively rare symptomatic lesions with significant morbidity and mortality; and, finally, discuss the rationale for and against screening and restricting the activities of at-risk individuals. 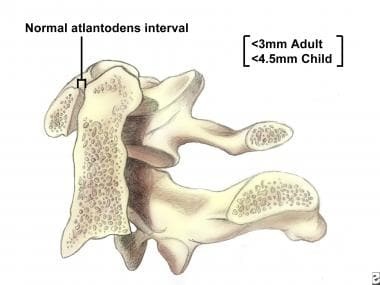 AAI, also known as atlantoaxial subluxation, is radiologically identified increased mobility or laxity between the body of the first cervical vertebra (atlas) and the odontoid process of the second cervical vertebra (axis) (see the image below). [1, 2, 3, 4, 5] The subluxation can be anterior, posterior, or lateral, and symptoms occur as a result of cervical cord impingement. Medial-sagittal cross-sectional view of the atlas (C1) and the odontoid process of the axis (C2). Although traumatic lesions involving the atlantoaxial region are relatively rare, certain disease states and conditions present a higher theoretic risk of instability due to increased atlantoaxial joint laxity. Surveys indicate 10-25% of patients with trisomy 21 have AAI. [6, 7] Two thirds of these cases are due to laxity of transverse ligament, whereas one third are due to abnormal odontoid development. Although this association has been depicted on radiographs, the clinical incidence of serious cervical spine injury is not increased in this population compared with other populations. About 25% of patients with rheumatoid arthritis have atlantoaxial instability, which is thought to be due to chronic inflammation. Congenital skeletal dysplasias may cause resultant odontoid hypoplasia. Marfan syndrome may involve ligamentous laxity, and acute inflammatory processes can affect the retropharyngeal, neck, or pharyngeal spaces. For excellent patient education resources, visit eMedicineHealth's First Aid and Injuries Center. Also, see eMedicineHealth's patient education article Neck Strain. The articulation of the odontoid process of C2 (axis) with the anterior arch of C1 (atlas) allows for 50% of cervical lateral rotation. The transverse and alar ligaments maintain joint integrity and limit posterior motion of the odontoid process relative to the C1 anterior arch. Abnormal posterior translation (or subluxation) can cause cervical cord impingement with the potential for significant neurologic compromise and even death. Achar S, Achar SK. Atlantoaxial instability. Bracker MD, ed. The Five Minute Sports Medicine Consult. Philadelphia, Pa: Lippincott, Williams and Wilkins; 2000. 24-5. Canale ST, ed. Campbell's Operative Orthopaedics. 9th ed. St. Louis, Mo: Mosby-Year Book; 1998. Wheeless CR, Nunley JA II, Urbaniak JR, eds. Wheeless' Textbook of Orthopaedics [online]. Available at http://www.wheelessonline.com/. Accessed: March 6, 2008. Tanner SM. The pediatric athlete. Sallis RE, ed. American College of Sports Medicine Essentials of Sports Medicine. Indianapolis, Ind: American College of Sports Medicine; 1997. 219-20. Staheli LT. Atlanto-axial instability. Behrman RE, Kliegman R, Nelson WE, eds. Nelson Textbook of Pediatrics. 15th ed. Philadelphia, Pa: WB Saunders Company; 1996. 1950-1. Special Olympics. Coaching guides: participation by individuals with Down syndrome who have atlantoaxial instability. [Full Text]. American Academy of Pediatrics Committee on Sports Medicine and Fitness. Atlantoaxial instability in Down syndrome: subject review. Pediatrics. 1995 Jul. 96(1 pt 1):151-4. [Medline]. Kim DH, Hilibrand AS. Rheumatoid arthritis in the cervical spine. J Am Acad Orthop Surg. 2005 Nov. 13(7):463-74. [Medline]. Torg JS, Ramsey-Emrhein JA. Suggested management guidelines for participation in collision activities with congenital, developmental, or postinjury lesions involving the cervical spine. Med Sci Sports Exerc. 1997 Jul. 29(7 suppl):S256-72. [Medline]. Alpizar-Aguirre A, Lara Cano JG, Rosales L, Míramontes V, Reyes-Sánchez AA. [Surgical treatment of craniocervical instability. Review paper] [Spanish]. Acta Ortop Mex. 2007 Jul-Aug. 21(4):204-11. [Medline]. Claybrooks R, Kayanja M, Milks R, Benzel E. Atlantoaxial fusion: a biomechanical analysis of two C1-C2 fusion techniques. Spine J. 2007 Nov-Dec. 7(6):682-8. [Medline]. Huang CI, Chen IH, Lee LS. Traumatic atlantoaxial distractive instability: case report. J Trauma. 1994 Apr. 36(4):599-600. [Medline]. Ohya J, Chikuda H, Kato S, Horiguchi H, Takeshita K, Tanaka S, et al. Risks of in-hospital death and complications after fusion surgery in patients with atlantoaxial subluxation: analysis of 1090 patients using the Japanese Diagnosis Procedure Combination database. World Neurosurg. 2015 Apr. 83 (4):603-7. [Medline]. Pradhan M, Behari S, Kalra SK, et al. Association of methylenetetrahydrofolate reductase genetic polymorphisms with atlantoaxial dislocation. J Neurosurg Spine. 2007 Dec. 7(6):623-30. [Medline]. Disclosure: Received royalty from SLACK Publishing for independent contractor.